Avian Conservation and Ecology: Don’t shoot the messenger! Hobson, K. A., and R. Norris. 2015. Don’t shoot the messenger! Avian Conservation and Ecology 10(2):8. Every year brings with it a host of issues and developments that impinge directly or indirectly on the conservation of birds from local to global scales and 2015 was no exception. Most readers will be familiar with the usual list of concerns that collectively describe the threats to birds and other wildlife caused by the emergence of the Anthropocene, or the era that now typifies the impact of humans on all aspects of life on earth. Within this milieu, we find ourselves challenged to conserve the world’s avifauna with an urgency that is unprecedented. In Canada our challenges are compounded, in part, by a perception among many that most factors affecting populations of birds must be happening elsewhere and that we still occupy a land of endless wilderness punctuated by a relatively small human population. The facts of course speak otherwise. At Avian Conservation and Ecology, we see our role primarily as one of providing the best scientifically defensible evidence possible that bears on the conservation of birds in Canada and throughout the world by publishing high-quality, peer-reviewed scientific papers. However, we also try to promote an open dialogue among our readers on current issues and concerns and part of this will be through the publication of guest editorials. The first of these was by Dr. Linda Wires who bravely challenged the practice of massive population reduction practices directed at Double-crested Cormorants (Phalacrocorax auritus) underway in the United States (Wires 2015). We plan to continue this tradition and readers are encouraged to contact the editors with suggestions. Within the realm of avian conservation, two events in 2015 will also be of interest to our readers. The first was the release of a film that featured a number of studies underway largely in Canada and the USA that pertain directly to the conservation of songbirds, and the other was a paper reminding us of the generally inadequate protection of most of the world’s migratory birds. Together, these very different developments serve to underline a new urgency in avian conservation in general, and the need for a paradigm shift in the way we deal with landbird conservation in the Americas in particular. The Messenger, directed by Su Rynard and produced by SongbirdSOS Productions Inc., was released in Canada 28 April and in the USA 11 October 2015 (http://songbirdsos.com/abou/messenger). 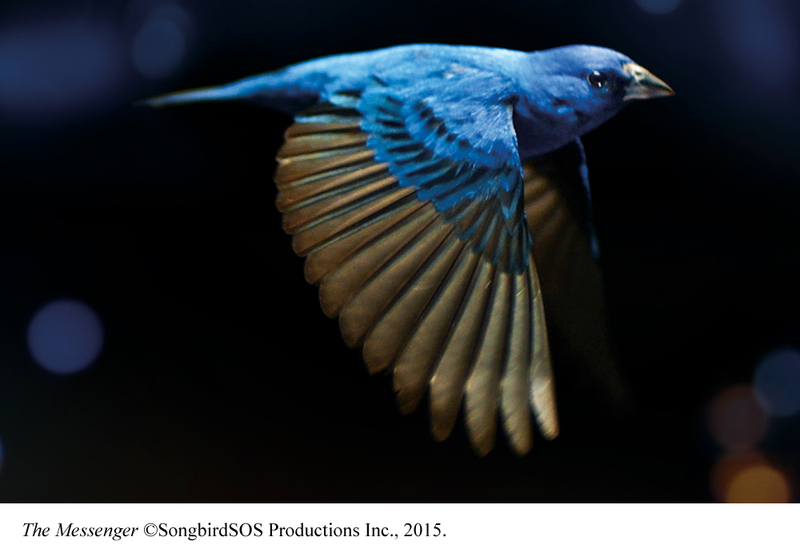 This is a must see film for anyone who cares about songbird conservation. There is no voice-over script. Instead, the film relies on visual encapsulations of the work of several leading researchers in North America and elsewhere associated with academia and nongovernmental organizations and allows these individuals, and the footage, to tell their own stories. Most stunning are the segments of the film that show, in slow motion, birds in flight; an amazingly beautiful and captivating thread that ties the film together. That footage was accomplished with the help of Dr. Chris Guglielmo using the wind tunnel at the Advanced Facility for Avian Research (AFAR) at the University of Western Ontario and underlines the fact that such facilities can benefit a wide range of uses from fundamental research on avian physiology to the promotion of a purely aesthetic appreciation of birds. Indeed, this film is primarily an emotional appeal to educate us about the magnitude of the perils facing songbirds everywhere and to motivate us to be more effective in our efforts to protect them; and in that regard, the film is a great success. Other prominent Canadian researchers featured in The Messenger include Dr. Bridget Stutchbury, of York University, who pioneered the use of light-sensitive geolocators for tracking small migrant songbirds en route from North America to the Neotropics. Her work has been a catalyst for a growing effort to use such technologies to make connections between breeding and wintering populations and to better consider the hemispheric nature of conservation needs for songbirds around the world. Dr. Christy Morrissey, of the University of Saskatchewan, was featured for her work on the impacts of pesticides, notably neonicotenoids, on wetland ecosystems supporting birds on the Canadian prairies. Dr. Erin Bayne, of the University of Alberta, was also featured for his ongoing landscape-scale work on songbirds of the western boreal forest, especially those species potentially impacted by oil sands developments. The ongoing critical work by Bird Studies Canada was also referenced. The film ends with coverage of the impact of office tower collisions with nocturnally migrating songbirds through Toronto and features the impressive efforts of Michael Mesure and colleagues in the Fatal Light Awareness Program (FLAP) to document this tragic, and seemingly avoidable, waste. Missing from The Messenger was mention of the research, monitoring, and enforcement efforts of Environment Canada. This was largely because of the difficulties the filmmakers experienced in trying to deal directly with government during recent years, a situation that hopefully now is behind us. As many of our readers will know, Environment Canada spearheaded the quantification of human-related mortality of birds in Canada, and those results were published in a special issue of Avian Conservation and Ecology (Volume 8, 2013). There now needs to be a follow-up program to strategically examine where we go from here based on these results. There is great potential to design optimal mitigative measures that aim to reduce such mortality. Such measures may range from educating cat owners to working with industry and city planners. We need to work within the context of the Migratory Bird Convention Act to effectively reduce the human-related sources of avian mortality (Longcore and Smith 2013). We hope that the The Messenger will also be an important vehicle to motivate the Canadian government, in cooperation with other researchers and managers, to continue its efforts in this important area. The Messenger ambitiously sought examples of issues associated with songbird conservation in Europe and Central America; who will forget the footage of an Ortolan Bunting (Emberiza hortulana) being consumed in France? Closer to home, the theme of full lifecycle conservation of birds that migrate between Canada, the USA, and Latin America could have been even more emphasized because of the large percentage of our avifauna that leave North America during the fall and winter, and the difficulties inherent in conserving birds that cross international boundaries. Although a number of researchers in North America are working on aspects of migratory connectivity and the wintering and stopover ecology of songbirds, this is an area in urgent need of attention, and federal governments could play a key role in coordinating such efforts in a more strategic manner. An important recent publication has helped to focus attention on the generally poor state of conservation of the world’s migratory landbirds. Runge et al. (2015) examined the degree to which migratory species throughout the world benefit from protected areas at each stage of their annual cycle. They found that only 9% of 1451 migratory species are adequately protected compared to 45% of nonmigratory species. These are also likely overestimates because they only considered the occurrence of protected areas and not whether those areas are indeed effectively managed or protected. Although the paper only considered overlap between the distribution of protected areas and the flyways used by migratory species (i.e., actual proportions of extant populations receiving protection were not quantified), Canada and the United States did not fare well among comparisons with other countries. There are many reasons for this but, in North America, our focus has been more on migratory species requiring wetlands rather than on landbirds per se when it comes to actual habitat protection, e.g., Ramsar Convention on Wetlands. Conserving migratory songbird habitat is much more challenging but as the authors point out (Runge et al. 2015:1258), “safeguarding the world’s migratory birds will require better resourcing and use of existing international mechanisms to target new and expanded protected areas, enhance enforcement and management effectiveness, and greatly strengthen coordination between countries.” Within this spirit, there is great scope now for a new look at the plight of migratory songbirds in the Americas, and the Canadian government must re-examine its priorities in this regard. The Messenger and the Runge et al. (2015) paper symbolize two very different approaches in the awareness campaign for migratory bird conservation, one spiritual and one cerebral. We applaud the efforts of those involved.